Graduate Aptitude Test in Engineering (GATE) is an examination that primarily tests the comprehensive understanding of the candidates in various undergraduate subjects in Engineering/Technology/Architecture and post- graduate level subjects in Science. The GATE score of a candidate reflects a relative performance level in a particular subject in the examination across several years. 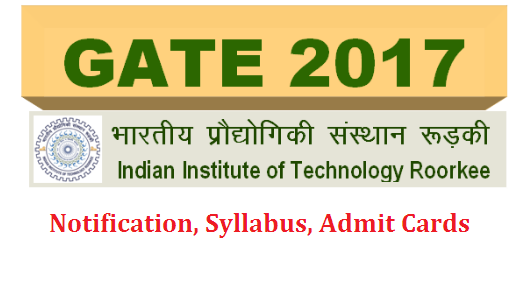 http://www.paatashaala.in/2016/08/gate-graduate-aptitude-test-for-engineering-notificatio-syllabus-admit-cards.html The score is used for admissions to post-graduate programs (e.g., M.E./M.Tech/ Direct Ph.D.) in centrally funded Indian Institutes of higher education (i.e., Institutes which are provided with financial assistance by MHRD and other Government agencies). The score is also used by some Public and Private Sector Undertakings for employment processes in India. Direct recruitment to Group ‘A’ level posts i.e., Senior Field Officer (SFO Tele), Senior Research Officer (SRO) (Crypto) and SRO (S&T) in Cabinet Secretariat is now being done on the basis of GATE scores. Application Process: For GATE 2017, all information related to the candidates will be available in a single GATE Online Application Processing System (GOAPS). Candidates have to register and fill the application via ONLINE mode ONLY. The photograph, signature, thumb impression, qualifying degree certificate, and category certificate (SC/ST/PwD) wherever applicable, must be uploaded during the online application. Candidates shall be required to enter the specified number in their identification card of any one of Passport, PAN Card, Voter ID, Aadhaar UID, valid College ID, Employee identification or and Driving License. The candidates who do not have any of these identity cards, may please get one of these cards issued before application procedure. Please note that no application form is available for sale anywhere. For International candidates, ONLY a valid Passport/ Government issued ID/College ID/ Employee ID shall be accepted as the recognized identification.